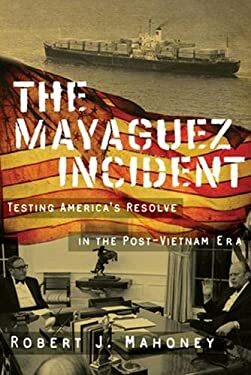 The May 12-15, 1975, Mayaguez incident was the “last chapter of the United States’ military involvement in Indochina, ” Robert J. Mahoney notes in The Mayaguez Incident: Testing America’s Resolve in the Post-Vietnam Era (Texas Tech, 336 pp., $39.95). The book is a detailed, multifaceted, and creditable account of what happened off the coast of Cambodia just days after the end of the Vietnam War. What happened was that Khmer Rouge forces, using captured American swift boats, seized the Mayaguez , an American merchant ship, in international waters. That left President Gerald Ford with a very difficult choice: Use force or negotiate? Mahoney, a retired Army colonel who is dean of academics and deputy director of the Marine Corps War College in Quantico, Virginia, looks at what the Ford administration did during the four-day crisis in almost hour-by-hour detail. Mahoney examines the strategic and tactical aspects of the military action that President Ford and his advisers undertook, as well as the international implications and domestic political ramifications of sending in the Marines (backed up by Navy and Air Force units).